Priscilla M. (Ouellette) Beaulieu, 92, of New Britain, widow of Paul Z. Beaulieu, passed away peacefully on Thursday, July 26, 2018, at St. Mary Home in West Hartford. Born in Ouellette, Maine, she was the daughter of the late Donat and Alice (Roy) Ouellette. Priscilla received her teaching certificate from Madawaska Training School. She was a New Britain resident since 1953. Priscilla was formerly employed as a teacher and later worked at Sears, Marshalls and Bradlees before retiring. She was a member of St. Francis of Assisi Church and the Ladies Guild at church, as well as the St. Jean Baptiste Society and its Ladies Auxiliary. Priscilla volunteered for many years at the Friendship Center, preparing and serving meals there. 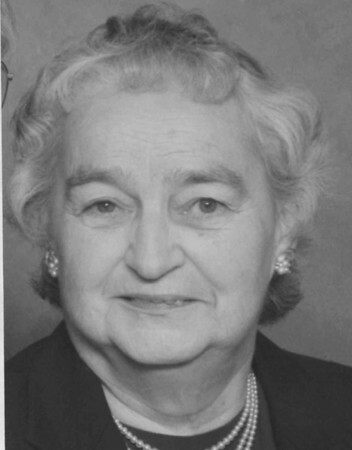 She also volunteered for many years when raising her daughters at the PTA, Girl Scouts, and Religious Education. Surviving are two daughters, Nancy Ringrose of New Britain, Sandra Cahill and her husband Michael of Suffield; and a grandson, Daniel P. Cahill of Enfield. In addition to her husband, she was predeceased by a son-in-law, John Ringrose; six brothers, Sylva, Albert, Bernard, Oneill, Leon and Gerard; and by two sisters, Rilda Ouellette Chase and Aurella Ouellette Coulombe. The family would like to extend their thanks to the Marlin Road neighbors and the staff at St. Mary Home, Baggott Street Unit, in West Hartford for their loving care. A Mass of Christian Burial will be celebrated on Friday, Aug. 3, 2018, at 11 a.m. at St. Joseph Church. Burial will be in Fairview Cemetery. Calling hours are Thursday from 6-8 p.m. at Erickson-Hansen Funeral Home, 411 S. Main St, New Britain. Memorial donations may be made to St. Mary Home, Baggott St. Unit, 2021 Albany Ave., West Hartford, CT 06117. Please share a memory of Priscilla with the family in the online guestbook at www.ericksonhansen.com . Posted in New Britain Herald, on Sunday, 29 July 2018 21:01. Updated: Sunday, 29 July 2018 21:04.